ISLAMABAD, April 2: The Patron-in-Chief of the Supreme Shia Ulema Board and chief of the Tehreek Nafaz Fiqh-e-Jafariya Agha Syed Hamid Ali Shah Moosavi has demanded that details of the actions taken against all proscribed parties and their heads may be brought forward for the nation and the world so as to end the foreign propaganda and internal doubts. Taking action against the proscribed parties nominated by foreign countries is not enough rather action against all proscribed parties responsible for giving a bloodbath to over 75,000 innocent citizens and army jawans may be taken without any fear and favor. Tightening noose around proscribed terrorists is the debt of Shuhada-e-Watan’s blood. Categorizing the proscribed parties is adding fuel to the fire for the bereaved families of Shuhada. The enemies are tightening noose around Pakistan therefore rulers and politicians should become a solid rock against the enemy instead of utilizing their energy to down one another. Muslim rulers are interfering in other States just to please the satanic forces. The drama of international terrorism has been staged to divert the world attention from long-standing Islamic issues of Kashmir and Palestine. Imam Musa Kazim (A.S.) thwarted every internal and external conspiracy against religion and Shariat through knowledge, wisdom and brave struggle. The whole life of Imam Musa Kazim (A.S.) was spent in prisons but the oppressive rulers failed in suppressing his righteous voice. Gathering of millions of people on his Mazar in Kazmain on the occasion of Youm-e-Shahadat of Imam Musa Kazim (A.S.) is solid proof of his eternal righteous victory. 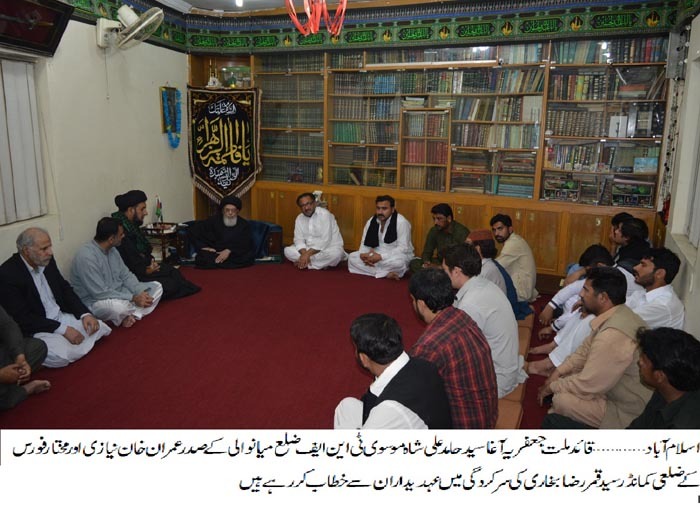 These views were expressed by him while addressing a Tehreek Nafaz Fiqh-e-Jafariya delegation from Mianwali. TNFJ Punjab spokesman Hassan Kazmi was also present during the meeting. Agha Moosavi said no one knows about the action taken against those parties who shed blood in Pakistan and destroyed uncountable homes and the country’s economy. Calling those traitors who raised voice against proscribed parties is not good. The government should take action against them which should be visible so as to remove the unrest of every patriotic person. He said Pakistan’s image the world over was tarnished owing to slackness in action against proscribed parties by the previous governments and fingers were pointed out on Pakistan by enemies despite historic sacrifices rendered by Pakistan against war against terror. Whenever any incident takes place anywhere, the responsibility of it is put on Pakistan. The TNFJ chief said the centre of politics by American, Indian and Israeli rulers in based on Muslim enmity but state of affairs for Muslims is so bleak that going for independence of Kashmir they has lost half of the Pakistan. On the other hand, he added, owing to incapability of Muslim rulers they could not end the illegal occupation of Israel rather lost the whole Palestinian soil to them. He said the areas including Golan Heights occupied in 1967 war have been taken over by Israeli but Muslim State neither lodged any protest nor raised a voice against this development. He lamented that OIC could not give a joint agenda to-date to Muslims while the satanic powers succeeded in their only objective to keep Muslim States under pressure so as to suppress the voices being raised for resolving the issues of Kashmir and Palestine to divert the world attention from the atrocities being committed against Muslims. Agha Moosavi said India in collusion with international powers has made Pakistan a target right from the beginning. The decision of the Redcliff Commission was misappropriated with the help of British colonial power and India was given passage to Kashmir by handing over the Muslim area like Gurdaspur to India as a result of which she illegally occupied Kashmir. He said the Hindu rioters committed so many atrocities against the migrating Muslims that history is ashamed of it as a result of which the biggest migration of human history was tuned into bloodshed. He said India division formula was trampled as a result of which India occupied the states of Hyderabad Deccan, Junagarh and Manawadar that were annexed to Pakistan. He said after Indian defeat in her attack on Pakistan in 1965, she promoted Mukti Bahini that turned East Pakistan into Bangladesh after which it was announced in the Indian Parliament that Ideology of Pakistan has been drowned in the Bay of Bengal. The Quaid-i-Millat Jafariya Agha Syed Hamid Ali Shah Moosavi said that India had been massacring minorities in the name of secularism. Hundreds of anti-Muslim riots have been reported in India, massacre was carried out in Assam and Gujerat, twenty thousand Masajid including Babri Masjid was razed to ground, army action was taken on Golden Temple of the Sikh community and Sikhs were massacred, and Christian missionaries were set ablaze in Orissa. All these incidents are the proof of Indian Hypocrisy and expose the so-called Indian secularism, he concluded.